Five years ago Australia played a key role in drafting and negotiating the UN Arms Trade Treaty in order, as the government announced at the time, “to reduce the impact of armed violence on communities around the world”. 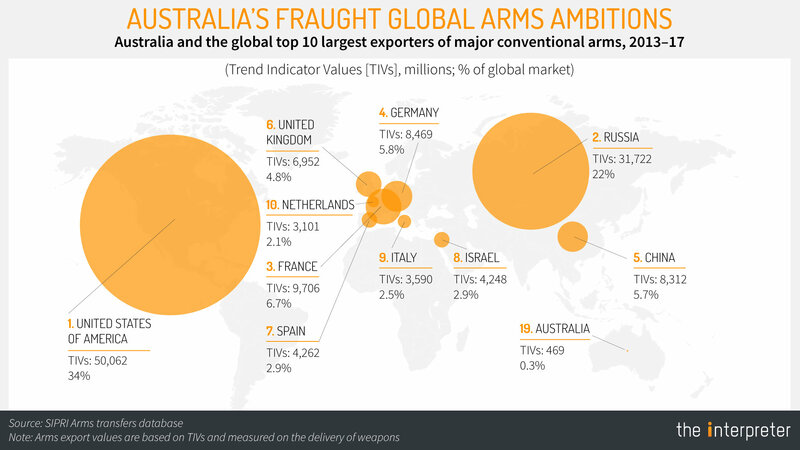 Five weeks ago Prime Minister Malcolm Turnbull announced his “vision” for Australia to become one of the top ten weapons exporting countries in the world. Rather than visionary, it struck me as grotesque. This regression from good global citizen to swaggering deputy sheriff reflects the contradictions at the heart of our foreign policy. Australia played a role some years ago in weakening the language of the cluster munitions ban treaty to allow exclusions for interoperability and transit of cluster munitions, and we refused to participate in the UN nuclear ban treaty negotiations last year, despite a strong track record of championing nuclear disarmament. Australia has reduced its development assistance to the poorest countries in the world to its lowest contribution in history at just 0.22% of Gross National Income, making us, the fourth largest economy in the Organisation Economic Cooperation and Development, one of the stingiest. This was aid that would have helped to build peace and governance and enhance human and global security. Ours is a country which has blindly followed the US into wars in Vietnam and Iraq that have been calamitous and yet (unlike the UK) we have failed to examine our contribution to the deaths of hundreds of thousands of innocent people and in creating a vastly less secure world. And (again, unlike the UK) our country has refused to implement war powers’ reform to ensure that only the Australian Parliament, not the PM alone, has the power to send Australian troops overseas to fight in wars. Today, visitors to the nation’s capital are confronted at the airport with enormous advertisements for defence contractors and arms manufacturers. Whereas other countries might showcase their natural environment and their tourist attractions at the airport, here we show off tanks, ships and missiles. What kind of image does this project to the rest of the world? 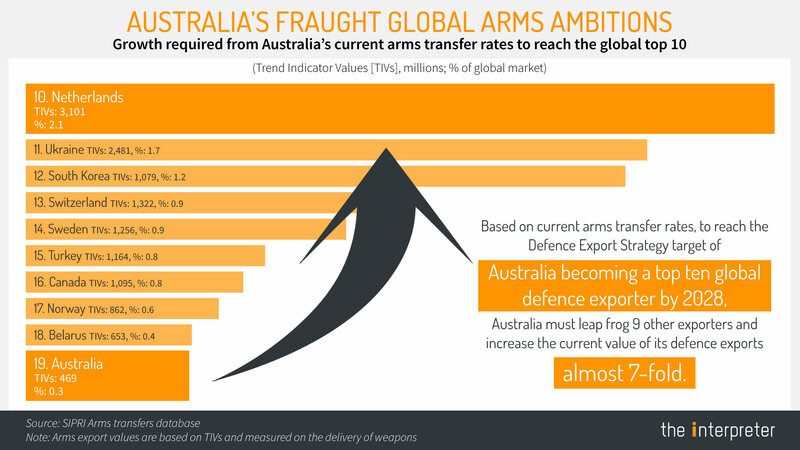 What does the PM’s “vision” to be one of the world’s top arms exporters say about Australia’s role and intentions in the world going forward? That instead of seeing our role as a good global citizen, promoting peace, prosperity and respect for human rights, we seek to increase the manufacture and sales of weapons that cause death, injury and destruction? It is particularly abhorrent that the government has identified the Middle East, much of which is presently mired in conflict, as a “priority market”. This seems a long way from the Australia that helped draft the United Nations Charter and the Universal Declaration of Human Rights; the Australia that has been a strong advocate for the UN, multilateralism and the international rule of law, and the Australia that has been actively engaged in constructive diplomacy as a middle power. It stands in contrast with the vision set out by Prime Minister John Curtin in his last major parliamentary speech made on 28 February 1945, a few months before he died, when he championed the new international peacekeeping organisation that would after the war become the UN. If we are to concert with other peoples of good will in order to have a better world, there must be some pooling of sovereignty, some association of this country with other countries, and some agreement, which, when made, should be kept … There is a price that the world must pay for peace; there is a price that it must pay for collective security. I shall not attempt to specify the price, but it does mean less nationalism, less selfishness, less race ambition. Does it not mean also, some consideration for others and a willingness to share with them a world which is, after all, good enough to give each of us a place in it, if only all of us will observe reason and goodwill towards one another? Australia’s standing in the international community is in jeopardy. It is time to rediscover our distinct interests and identity, and to be consistent in projecting these to the world. Part of that journey will be letting go of the policy of strategic dependence that we have usually followed – initially with regard to Great Britain and then, from the middle of the Second World War, the US. As a result of such strategic dependence, our policies in terms of nuclear deterrence, defence procurement and interoperability, among others, are closely intertwined with those of the US. This constrains Australia’s ability to forge our own path in the Indo-Pacific region and the wider world. A properly independent foreign policy would support an outward-looking Australia that is consistent with our own view of ourselves as a clever, tolerant and generous country; a country that uses its considerable resources and skills to promote sustainable development, clean energy, access to health and education for all, equality and human rights; a middle power that participates positively in the challenges that go beyond national borders, exercising its good offices to prevent conflict and achieve a more peaceful, nuclear-weapons-free world. Being one of the world’s biggest arms exporters has no place in that vision. The Turnbull government is spending $200 billion over the next decade to build-up our military capabilities, the largest amount in peacetime history. We need those weapons, vehicles, ships, systems, and aircraft to defend our nation and our interests. Capability is our first priority but, unlike previous governments, we are looking to invest as much of that commitment here in Australia to drive jobs, wealth, and growth in our economy. A strong defence industry in Australia gives us greater self-reliance. It allows us to do more in the region, and for our people to feel safer and more secure. Australia will never be completely self-reliant in terms of defence materiel, but that shouldn’t and won’t stop us from striving to be as self-sufficient as possible. Each day I am given more reasons to be impressed with and encouraged by Australia’s defence industry. Our defence industry has the development capability, and that is the most important thing. However, we have been letting ourselves down by not capitalising enough on our global competitiveness and selling that capability to our friends and allies, as they sell to us. To better help Australia and our defence industry reach its full potential, the Prime Minister and I, along with the Minister for Defence, launched the Defence Export Strategy at the start of the year. The Strategy is the first of its kind and will bring together the efforts of the Government and industry as we aim to grow Australia’s defence industry, with an ambitious goal to become a top-ten global defence exporter within a decade. As part of the Strategy, the Australian Government will establish a Defence Export Office which will be a first port of call for defence companies wanting to export, and be responsible for implementing the various programs and initiatives of the Strategy. I encourage Australian defence companies who are looking to export capabilities to seek them out. I will also appoint an Australian Defence Export Advocate who will identify export markets and coordinate our campaign efforts. This person will help me by being at the right hand of industry as we seek to engage with the governments and militaries of our friends and allies and look to promote the export of our world-class materiel. We are supporting Australian companies to reach overseas markets in other ways. Last week, I launched the second edition of the Australian Military Sales Catalogue which features the products and services available from 69 Australian businesses. It’s worth examining why this Export Strategy is so vital. Defence industry and defence exports are unique because their only customers are governments. When an Australian company goes overseas to try and sell to a government, the first question is always, “Does Australia support this?” That’s why I regularly speak to my counterparts in the governments of our friends and allies around the world to endorse and recommend Australian defence industry companies and equipment. I often say that Australia will never be able to compete when it comes to making T-shirts. But we can compete when it comes to making high-end, world-beating defence equipment: from radars to armoured vehicles, ammunition to radios, sonars to tail fins, and yes, even warships. Like any industry, a strong defence industry is one that exports. Our country as a whole benefits from exports. An exporting company is in a better position to expand more, employ more, and invest more in R & D. That allows Australia’s defence industry to deliver better capability to our forces, and to help them better defend our country. It also provides a strong and growing career path for young Australians in the defence sector – not only in the Department of Defence and Defence Forces, but also in our defence industry. It’s exciting, it’s useful, and it helps defend our country. And, as Australian of the Year, Professor Michelle Simmons told me during a recent interview on my Sky News show Pyne & Marles, one of the challenges of attracting young Australians into STEM courses is to show them the types of jobs this path of study can lead to. Australia is world-leading in the production of military equipment and components. For example, the CEA Phased Array Radar is better than the radar used in the US, is being considered by the UK for use on some ships, is the most capable radar of its type in the world, and is standard on our new ships. It’s made in Fyshwick, an industrial suburb in Canberra. The Bushmaster and Hawkei vehicles, made by Thales Australia in the regional town of Bendigo, are world-beating when it comes to troop protection and movement. Thales Australia also exports sonar products to France. The Stockholm International Peace Research Institute (SIPRI) index recently upgraded Australia’s export ranking one place, to position 19. But SIPRI doesn’t include much of Australia’s production, and therefore seriously underestimates our overall output. SIPRI only captures major platforms and subsystems, and only uses public-source data. 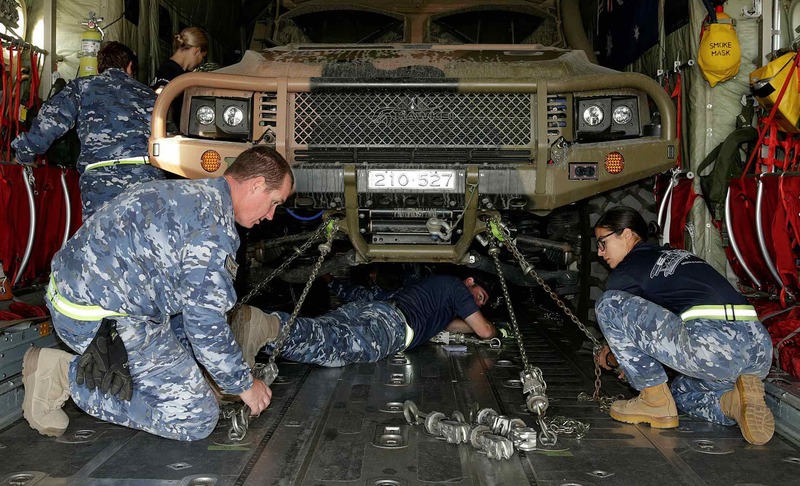 Australia makes some major platforms, such as Bushmaster vehicles or Austal’s ships for the US Navy, but it makes a lot more components. SIPRI doesn’t include Birdon, who won a US $261 million contract to make boats for the US Army. It doesn’t include the Nulka decoy, to a value of over $1 billion. It doesn’t include Thales’s $500 million of exported sonar technology. Nor does SIPRI include the more than $1 billion of exports of components for the Joint Strike Fighter. We’re already further up that ranking than we think we are. But I want us to be higher. The Turnbull government is transforming the way we acquire military capability, and defence companies from around the world have responded. They no longer just outline the strengths of the capability they can develop and manufacture. They also demonstrate how many Australian workers will be employed, how many Australian companies will be in the supply chain, how much Australian product will be used, and how Australian industry will be further developed. For example, with the recent announcement of the decision to build 211 Rheinmetall Boxer armoured fighting vehicles, it was shown that Australian industry content for the acquisition and sustainment of the vehicles would be around 70%; up to 1450 jobs will be created nationally; more than 40 local suppliers would be used from around the country; and that Rheinmetall would establish a Military Vehicle Centre of Excellence. We are seeing similar commitments from the three companies who submitted tenders to build our future frigates. More than 10,000 direct new jobs, and tens of thousands more indirectly, will be created by companies investing in Australia and our defence industry based on the certainty given by the Government’s clear commitment and direction. Our nation will be more secure because of that clear commitment and direction. Our Defence Export Strategy not only complements, but is a logical extension of our significant $200 billion investment in military capability.